U.S. government black PSYOP falsely appears to originate from a hostile source (person, party, group, organization, government). The interest of the U.S. government is concealed and the U.S. government would deny responsibility. It is best used in support of strategic plans. Covert PSYOP is not a function of the U.S. military but instead is used in special operations due to their political sensitivity and need for higher level compartmentalization. Further, black PSYOP, to be credible, may need to disclose sensitive material, with the damage caused by information disclosure considered to be outweighed by the impact of successful deception. In order to achieve maximum results and to prevent compromise of overt PSYOP, overt and covert operations need to be kept separate. Personnel involved in one must not be engaged in the other. Note 1: Alex Jones refers to Infowars figuratively as “the tip of the spear,” while the emblem/seal of the United States Special Operations Command is literally the tip of a spear. Note 2: Alex Jones refers to Infowars figuratively as “deep behind enemy lines,” while United States Special Operations Forces literally work deep behind enemy lines in foreign nations. ALEX JONES’ DIVORCE AND CHILD CUSTODY CASE GO PUBLIC: Alex Jones’ father testified in court on Monday, April 24th, saying in part that he has made “millions of dollars” over the past several years creating front companies that contract business with Infowars. 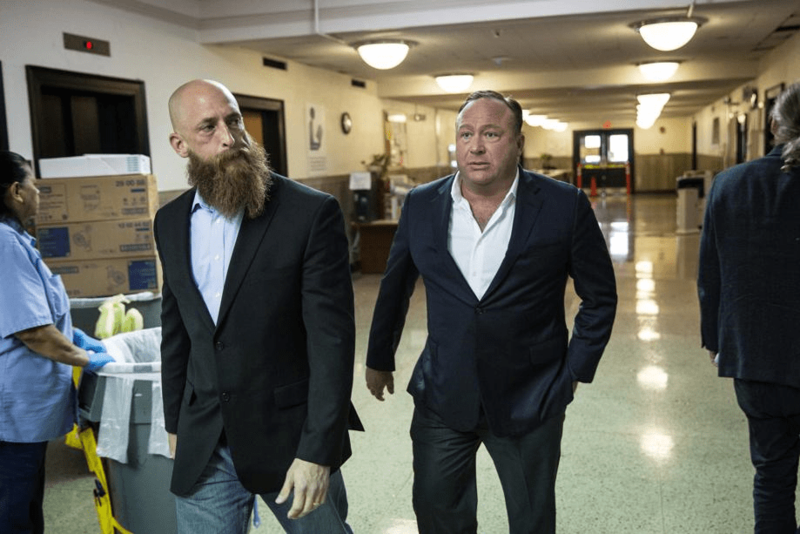 Alex Jones’ mother testified in court on Friday, April 21st, saying in part that Infowars is a “family business” and that she and Alex Jones’ father are both heavily involved in all aspects of the Infowars operation. Since Alex Jones has already stated in the past that both of his parents were/are C.I.A. operatives, these recent admissions from Alex Jones’ parents constitute direct evidence that Infowars is a covert U.S. Govt. intelligence operation. Alex Jones arrives at Travis County Family Court with his ex-Blackwater mercenary bodyguard Quentin Carter. Jones rarely ventures into public without Carter at his side. As part of his occupational duties with Blackwater, Carter provided physical protection to high level U.S. Dept. of Defense officials in the Middle East during the Iraq War, and now performs a similar function for Jones. Alex Jones employs several such private military contractors and U.S. military special-ops agents, a fact which supplies further evidence that Infowars is a covert C.I.A. and/or Dept. of Defense intelligence operation.